Charming, updated oceanfront one bedroom, one bath condo. 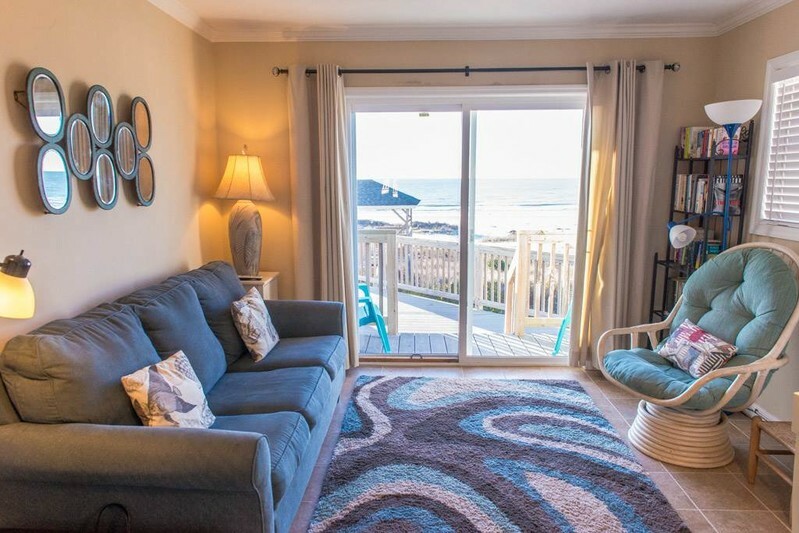 A perfect get-away for a couple or small family to come to the beach and stay oceanfront! Close to pier and OIB town center attractions such as ice cream shop, casual restaurants, mini golf, boutique beach shops, arcade and Carolina Museum. Complete kitchen with microwave and dishwasher, programmable coffee maker with pod option. 2 flat screen TVs, DVD, Wi-Fi, central heating & air, plus ceiling fan. Bath has walk in shower. There is a large shared gazebo, sundeck, outside shower and private beach access for guests of this only six units complex. Full linen service included in the rental rate - includes bed sheets and bath towel sets. (NO LINENS DURING WINTER MONTHLY RENTALS) NON smoking. NO pets. Maximum parking for 2 cars only, as there are designated parking spaces.. NO washer/dryer. Great little condo! They have thought of everything you would need. Comfy chairs on the front porch for enjoying a book from the well-stocked bookcase while you watch the surf roll in. Perfect for a getaway week in the sun. Good location, able to walk to get coffee or to several restaurants for dinner. I'll definitely be back! We enjoyed our stay at Ocean Isle Beach so much. Our condo was small, but cozy and perfect for the two of us! It was very clean, and had a very easy (and well kept) walkway to the beach. The view from our condo porch was beautiful, and we thoroughly enjoyed sitting under the gazebo each night. We definitely were not ready to leave! We will be coming back, and hope to stay in the same condo! Just wanted to let you know that I had the BEST time at our little condo. It was clean and very updated, right on the beach!!!! Ocean Isle rocks!!!!!! I would definitely stay at this condo again. Thanks for all your help.